Singapore, 28 July 2011 – Looking for the hottest names in music or simply in the mood for retro mojo? Dig out those shoulder-padded jackets and go-go balloon pants, bring out your glow sticks, and get ready for Asia's biggest sporting and entertainment extravaganza. 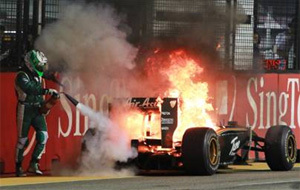 The 2011 FORMULA 1 SINGTEL SINGAPORE GRAND PRIX is nothing short of a mind-blowing world festival featuring international headliners, stunning theatrical-visual productions, retro disco showcases, and electrifying parades – all in one fully loaded circuit park. "With the Grand Prix as our centerpiece, we've packaged the event as a whole weekend of festivities and treats for the entire family," said Sarah Martin, Director of Operations and Security. "We've packed in a host of entertainment activities to ensure every ticket offers great value for money and the event continues to be a must-attend weekend for Singaporeans and international audiences." With one ticket, fans can access a S$5 million entertainment line-up, and enjoy hours of track action including Formula One and support races like Porsche Carrera Cup Asia and the JK Racing Asia Series. Ticket prices start as low as S$38 for a Zone 4 Friday Walkabout pass while a three-day Premier Walkabout ticket averaging at S$149 per day offers access to all zones and over 103 stage and roving performances within the circuit park. Get ready for an explosive session with twice Grammy winning rock band LINKIN PARK as they showcase a one night only multi-media experience featuring hits from "A Thousand Suns" at the Padang main stage on race day, 25 September. To watch the concert up-close from the Fan Zone right in front of the stage, collect a wristband at stage front - limited to 2,000 fans per day on a first-come-first-served basis. Joining the headliners assembly is Glee starlet and YouTube sensation CHARICE whose soaring 10-decibel voice has seen her performing alongside Celine Dion and Andrea Bocelli, and receiving lavish nods from Oprah Winfrey and David Foster. Look out for Charice at the Padang stage in Zone 4 (Friday) and Village stage in Zone 1 (Saturday). More headliners will be announced in the coming weeks, visit www.singaporegp.sg for updates. Who can forget deep-throated Mr 'Boombastic' and the man behind 'It Wasn't Me' and the infectious cover 'Angel'. 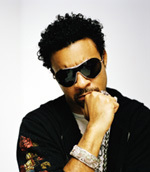 Reggae fans, heating up your night is multi-platinum, Grammy winning artiste SHAGGY who will perform at the Esplanade Outdoor Theatre (Zone 4 – Saturday) and Village stage (Zone 1 – Sunday). Singapore GP is thrilled to announce a Friday highlight at Zone 4's Esplanade Outdoor Theatre stage which sees an eclectic, one off, DJ set by experimental trip hop prodigies, Massive Attack's DADDY G & 3D. Massive Attack are artists, producers and legendary musicians. The duo, Robert "3D" Del Naja and Grant "Daddy G" Marshall from Bristol, England are considered to be progenitors of the trip hop genre. Their debut album, Blue Lines was released in 1991, with the single 'Unfinished Sympathy' reaching the charts and later being voted the 10th greatest song of all time in a poll by U.K.'s The Guardian. Wednesday night Zouk clubbers, don’t be shy now. Relive your ‘Love in the First Degree’ for those rusty dance moves as Zouk – celebrating its 20th anniversary – presents a mass MAMBO JAMBO on Sunday night at the floating platform (Bay Stage) for Bay Grandstand ticketholders only. 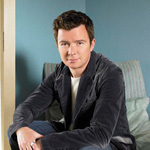 Sing your heart out with RICK ASTLEY as the legendary showman belts out familiar tunes like 'Together Forever' and 'Lights Out' at the Esplanade Outdoor Theatre (Saturday) and Village Stage (Sunday). Come on, you know you're never gonna give him up. For the first time ever, race-goers can catch two full-fledged musicals both in Zone 1 and Zone 4. Hindi music fans can shake their booties in a mass 'Jai Ho' dance with the cast of BOLLYWOOD EXPRESS (Esplanade Outdoor Theatre – Friday, Village stage – Saturday and Paddock Club Lifestyle Stage - Sunday), a colourful musical featuring cult favourites such as 'Chaiyya Chaiyya', among others. The 45-minute song-dance affair is conceptualised by the celebrated producers of Merchants of Bollywood, a sold-out production in London and Singapore last year. Just for laughs, indulge in some truly Wicked sport with cult New York show FORBIDDEN BROADWAY (Village stage – Friday & Sunday), a satirical revue that does hilarious spoofs of contemporary Broadway shows from The Phantom of the Opera to Rent, Les Misérables and Hairspray. 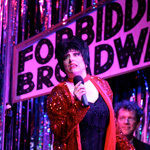 New York' longest-running musical comedy revue, Forbidden Broadway promises to have you in stitches from the start! Zone 1 and Premier Walkabout ticketholders can take a surreal walk through the Milky Way, accompanied with contemporary music and movie soundtracks, as the F1 Village near Gate 1 will be illuminated by recreations of 10 planets based on actual NASA imagery. The LA TERRA AL CENTRO DELL'UNIVERSO is a visual spectacle specially commissioned for the Singapore night race with the largest planet hovering at 5-metres tall. Outdoor visual-theatre maestros Studio Festi will be transforming sections of the circuit park into a spectacular treat for the senses. Exclusive to Zone 1 (Friday and Sunday) is the VENETIAN FESTIVAL, a time-forgotten classical theatre show that involves elaborate props like an inflatable moon and mysterious actors clad in Baroque-era costumes and whimsical masks weaving their way through the crowd. Exclusive to Bay Grandstand ticketholders in Zone 3 (Friday & Saturday) is a grand installation on the floating platform (Bay Stage) featuring acrobatic ballerinas twirling midair in bird cages, leaping out of a giant water bowl, and suspended gracefully as sea creatures on life-sized hooks and coral branches. Presented by Studio Festi, the OCEAN SYMPHONY is an underwater-themed extravaganza that makes use of water from the bay to create a stunning visual spectacle. Get down and dirty with kinetic artist BRIAN OLSEN as he puts up an energetic showcase of art in motion, splashing paint onto blank canvas to create life-sized portraits of famous personalities. Zone 1 ticketholders can witness this live on Friday, Saturday, and Sunday at the Marina stage. In addition to an assortment of roving performers from magicians to percussionists and stilt-walkers roaming the circuit park, race-goers can look out for several eclectic world parades. Spoiler Alert: Look out for fireworks (presented by SingTel) lighting up the night sky near selected stages in the circuit park! 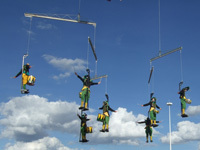 Follow crowd gatherers TRANSE EXPRESS as they drum up a procession ala Pied Piper and get lifted onto airborne mobiles. Then watch out for the fire-eating fakir of JAIPUR MAHARAJA BRASS BAND who juggles with knives and walks barefoot on nails before feasting your eyes on the flamboyant girls of SAMBA BRASIL – back by popular demand for the fourth year. If that's not enough, let Pan-African performers FRITITI delight you with their high-energy dances, acrobatic feats, infectious rhythms and stilt-walking stunts. Last year, Singapore GP's entertainment showcase at the Padang stage was voted "Best Concert" and the race itself was named "Best Global Showcase of Singapore" by CNNGo.